Sometimes just distracting yourself from unpleasant or distressing events *can* be part of the cure. It’s a great temptation to want to figure out the problem, learn the root cause of the issue (and many psychodynamic and psychoanalytical therapists advocate just that) and understand WHY you behave the way you do, or react to certain events in an out-of-proportion manner. It is also true that many events that happen to us in adult life may impact us in an incomprehensible way; they trigger our safety mechanisms or cause us to REACT rather than respond. Take one woman. She has recently emerged from an abusive relationship and is keen to find the right one for HER after some time out of relationships. She recognises that this past relationship was damaging and she did everything she possibly could to understand and mitigate further damage. She meets a lovely man who is very kind to her, almost too kind in a way such that she feels undeserving of his kindness. Each time he does something that doesn’t please or annoys her, she almost “attacks” him for being stupid, annoying, doormat like. Her experience as an abused woman has now turned her into the “abuser”, using her new man as a “whipping boy”. She is simply acting out of her own belief that she does not deserve a decent man. What can she do? What can her man do? The point is to recognise the repeating patterns of behaviour so that both can get the help they need to get off this roundabout of behaviour. He needs to stand up to her and recognise that this is not about him (although he may have his own patterns of neediness, lack of self-worth rooted from childhood), and she needs to understand that in any given moment she is hurting her man and to truly heal herself from her past and recognise that she needn’t perpetuate pain. But in the here and now, we may need to recognise that our brains have a limited ability to focus. We have to choose WHAT we focus on. Distraction can be a powerful tool in reducing the impact of painful or damaging experiences. In my therapy sessions when managing clients who have difficult relationships (men and women handle emotions in very different ways; more women will tend to ruminate and try to understand whilst arguably in the midst of trying to hold down a job, manage a young family) I often refer to the visualisation of putting the “difficult situation” in a box; tying it up with a ribbon of their choosing and placing the box on a shelf high up. You can get the box down when you feel you’re in a mindset to tackle the issue but in the meantime it’s out of sight, out of mind so you can continue freely with your day. I like the mantra “what others think about you is none of your business”. You need to survive and thrive rather than survive and feel beaten down with others’ obligations, feelings and emotions. 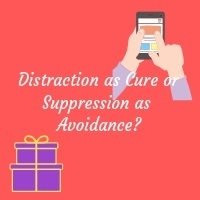 There is research showing that distraction can also help us with urges and impulses as the cognitive demands of a particular game or event redirect our attention onto something more interesting. Physical exercise – either to music or being out in nature can help us manage our attention more productively and keep us fit. One of my favourite worksheets (taken from “Drawing on Your Emotions” by Margot Sunderland) is this “First Aid” sheet (download). Here you simply fill in all the activities you enjoy doing, activities you’ve perhaps stopped doing. This helps you focus on what you DO enjoy and perhaps CAN enjoy as a distraction from the painful events you may be experiencing. As another form of “distraction as cure” you can experience a session of EFT which you can find out more about here. EFT is a way to diffuse painful emotions whilst engaging the mind and body to emerge from the painful feelings so you can manage more effectively in your life. Distractions also help you manage stress. But when can distraction cause a problem? When we simply “suppress” the emotions this can be damaging. Perhaps we are avoiding doing something because our situation is boring or we need to escape from something that isn’t doing us any good. Suppressing emotions (rather than using distraction as a positive expansion) can be when someone who is struggling with weight gain uses food to suppress their emotional status. The food is a welcome distraction in that sense because it keeps them from tackling the real source of the emotional eating. Once healed from the reasons that client eats, the food is seen in a completely different way and allows the client to manage their situation. People who are gripped by addiction use drugs, drink, gambling etc. to distract from their inner problem and until they manage this problem the addiction will continue. Some people argue the situation has to get bad enough so they have no choice but to manage this. Clients who have drink problems and have tackled it over and over, might get to the point of no return (i.e. one more drink will kill them, and yes, it has happened) before they either die or get their lives back on track. Here is where being mindful and self-aware once they find themselves going down the track of the drinking and catching themselves as they understand EACH step in the process. Perhaps we need to understand that distraction CAN be a cure and an expansive positive experience to replace the negative emotion but also establish whether your distraction mechanism is a sabotaging, escapist process that is preventing you from resolving issues in your life. Ask yourself “Why am I Doing This?” can help you make the most out of your “distraction”. Much of the above is sourced from here, together with some personal insights. Previous ArticleTherapy – an Essential Requirement?